For one of the finest and most decadent wine experiences, reserve a seat at Grand Old House’s sumptuous wine room for a private wine tasting not to be beaten. Hosted by one of the restaurant’s highly trained sommeliers, wine tastings at Grand Old House offer a fabulous opportunity to sample rare wines and vintages which you would be hard-pushed to find at some of the world’s finest restaurants. The wine room offers the ideal location for such a delicious event. With racks of wine from floor-to-ceiling and decanters in various shapes and sizes hanging from the wood-panelled walls, the room oozes sophistication and old-world glamour. Here, guests get to enjoy generous pours of a selection of fine wines all washed down with expertly paired canapés prepared by the restaurant’s team of award-winning chefs. Wine tasting events are geared to individuals, so whether you are a novice and just want some guidance on how to develop your wine knowledge, or you are an expert looking to further your expertise, the knowledgeable wine team at Grand Old House can help. During a recent trip, my guests and I sipped on fine wines while the restaurant’s head sommelier, Antonio “Nino” Hafner, explained each wine, the importance of the right stemware and decanters, storage, and more. Dunja Yeap, guest relations manager at Grand Old House, says that the wine tastings are designed to help enthusiasts navigate the restaurant’s extensive wine offerings, while giving oenophiles an opportunity to sample wines that they may not ordinarily choose. Grand Old House has gained a reputation amongst wine connoisseurs as the place to go for rare wines, expert advice, and an exceptional choice. 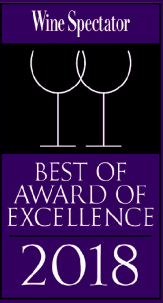 Indeed, the restaurant is a consistent winner of Wine Spectator’s Best of Award of Excellence, two glass rating. And, it is easy to see why Grand Old House is award-winning. The restaurant is home to Cayman’s largest wine collection, the second biggest wine collection in the Caribbean, and one of the 500 biggest wine collections in the world. Whatever tipple you fancy, Grand Old House can provide it. The restaurant has more than 2,100 different labels, totalling some 20,000 bottles of wines, including many hard-to-find labels. Located on the waterfront in the heart of picturesque South Sound, Grand Old House not only has an exceptional wine collection, but also offers a sumptuous menu, a collection of some of the rarest bourbons in the Caribbean, and fine cigars to boot. 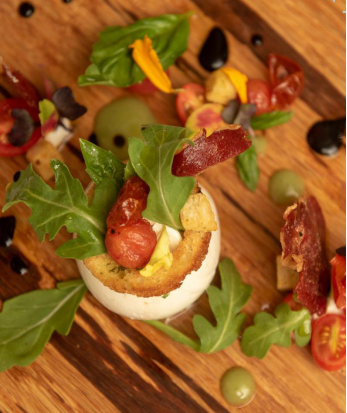 The restaurant’s setting in an old plantation house along with its storied 50-year history makes it even more of a must-visit gourmet destination for those looking to feast, sip, and enjoy some of life’s finest gastronomic pleasures. Many of the restaurant’s wines are housed in the wine room, where the private tastings can also take place. If you do book in for a wine tasting wear something warm as the room is set to a somewhat chilly 68 F, the ideal temperature, Nino says, to counteract Cayman’s high-humidity. An adjacent darkened room houses the restaurant’s exceptionally rare and more fragile wines. It is kept slightly cooler and only a privileged few get a chance to browse inside. In addition to hosting the restaurant’s wine tastings and advising guests on the right wine pairing for their meal, Nino, along with Luciano De Riso, Grand Old House’s wine director, is also charged with continuing to develop the restaurant’s award-winning wine collection. Nino says that many of the restaurant’s wines are sourced by working closely with local distributors. Hard-to-find wines and vintages are often sourced directly from wineries or from trusted wine auction houses. 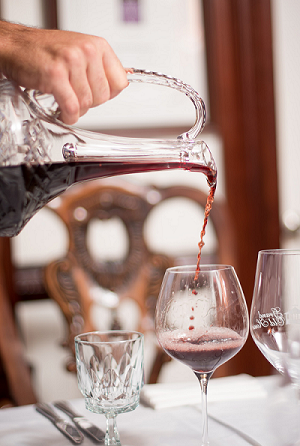 As a result, Grand Old House’s exceptional wine list boasts many unique selections that cannot be found elsewhere in Cayman, in addition to a wine menu that features multiple vintages of certain wines. Grand Old House is home to one of the rarest bourbon collections in the Caribbean. Amongst some of the rare bourbons available is an exceptionally hard-to-find one-gallon bottle of Old Fitzgerald Bourbon Bottled-in-Bond in 1974. This is the last bourbon that was distilled, blended, and bottled by Julian “Pappy” Van Winkle Sr. shortly after prohibition. Pappy Van Winkle’s Family Reserve is often regarded as one of the finest bourbons in the world. For cigar aficionados, Grand Old House’s Cuban-born Torcedor hand-rolls a selection of fine cigars every evening using authentic Cuban ingredients and utensils. The restaurant firmly believes that knowing about wine makes it all the more enjoyable to drink. In response to this, Grand Old House’s Wine Club was established in 2013 and offers the ideal venue for wine enthusiasts to develop their knowledge further. 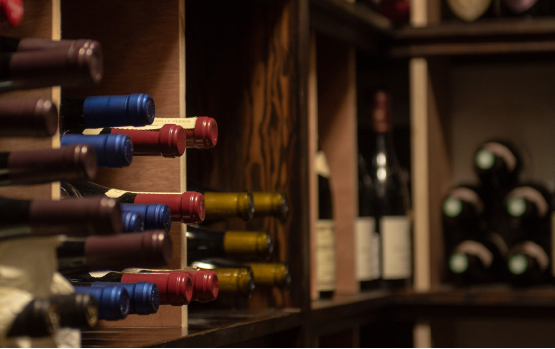 The club is comprised of different membership levels, which range from a selection of hand-picked boutique wines per month for entry-level members to the prestige of owning a personal wine locker to house your own collection in the wine room. Wine tastings form the cornerstone of the club, giving members the opportunity to sample a selection of some of the restaurant’s finest wines with knowledge and know-how imparted by the wine team at Grand Old House. So, whether you are looking for a rare vintage, a wine with a big bold flavour, or just wish to expand your knowledge on wine a little bit more, make sure you visit Grand Old House. While Grand Old House has the accolade of offering Cayman’s largest wine collection, its sister restaurant, The Wharf Restaurant & Bar, is also a firmly established destination for oenophiles. Indeed, the restaurant’s wine menu features an extensive choice of some 800 labels, embracing many regions and countries across the world. This collection has garnered the restaurant Wine Spectator’s Best of Award of Excellence, two glass rating. The restaurant also boasts Cayman’s only underground wine cellar. In addition to an outstanding wine collection, The Wharf features an enviable fine-dining menu expertly prepared by the restaurant’s team of international chefs. 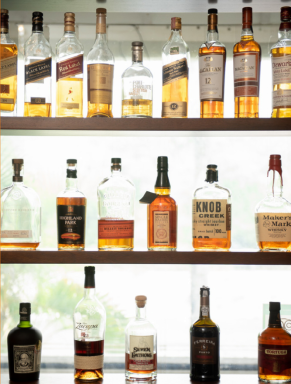 There is also a carefully curated bourbon collection on offer, as well as a selection of expertly hand-rolled cigars. 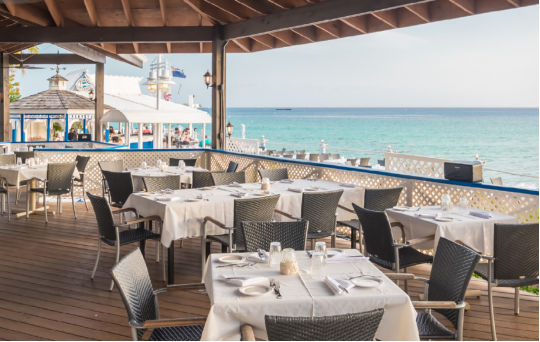 Established in 1988 and located along the start of Seven Mile Beach, diners can choose to enjoy their meal on the extensive deck which offers stunning waterfront views, or in air-conditioned comfort. The restaurant’s picturesque oceanfront bar, Ports of Call, offers a popular happy hour, from 5-7 p.m. seven days a week, while the nightly feeding of the resident tarpons which hover in the waters below the deck is a not-to-be-missed event. The event takes place every night at 9 p.m., but you’ll often spot the tarpons anxiously waiting for their tasty titbits from 6 p.m.
Grand Old House and its sister restaurant The Wharf have both been awarded Wine Spectator’s Best of Award of Excellence for their exceptional wine collections. The magazine recognizes restaurants and their wine lists with one, two, or three glass ratings. Both Grand Old House and The Wharf have been awarded a two glass rating. In 2018, the magazine awarded 64 recipients the Best of Award of Excellence in the Caribbean, with only a handful of those receiving a coveted two glass rating.